Day two at Sunday River started with Rich moving up to the yellow ski school class. Although this meant that they took him up the chairlift, he still got to ride the wagon behind the snowmobile most of the day. I am sure that this part was just as fun as the actual skiing for a 4 year old boy. After just two days, Rich is skiing the green circles on his own, and he and I got to take our first run together with him skiing the entire run on his own from the top of the chairlift. Angela went to another day of her ski school (no skiing, just playing) and Donna and I got to ski on our own for a second day. We had done this just once in the last four years so it was very nice to get out on the mountain together again. We finished off this great day with a family ride up the chondula. It was finally time for the 1st winter family vacation. We went up to Sunday River in Maine and decided it was time for Rich to try ski school. He had been skiing a few times before but had never skied on his own. Well in the first 45 minutes on the hill with his Sponge Bob skis, he was skiing the bunny slope on his own. He started the day in the red class and by the end of the day he moved up two levels to the green. Best part is he seems to really love it. Angela also had a first with her first time in day care. She was just as excited to go to "ski school" as Rich was. When we talked about it before we left for the trip she just kept saying how she would need her back pack. She cried when I dropped her off, but by the time I walked out the door she was all smiles. We went out for pizza and went back to the hotel to play games and roast marshmallows. Great day in the mountains. Since poor Angela is the second child she has not had the opportunity to do as many kid activities by herself. I have always realized this and finally signed her up for toddler yoga so we could have a mommy/Angela activity. SHE LOVED IT! The teacher was great and had really fun songs for the kids to relate yoga poses to. Angela was really the only kid in the class who sat on the mat and did everything asked of her. The other kids just ran around. We shall see what next week brings......you never know with Angela! 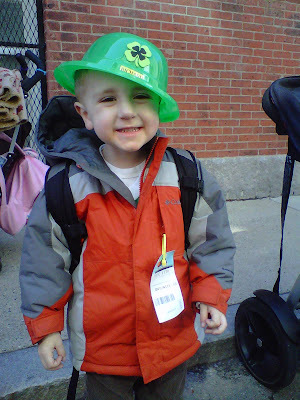 We had a fun Sunday afternoon at the Southie parade. Our friends the Ryan's (Emma and Molly) came as well. It is always a better time when your friends are there! The little girls napped until the big bands came by while the big kids begged the parade marchers for beads. We love the holidays that we get to celebrate for days. Chris and Richie went to Mt. Sunapee today for one of Chris's customer's annual tailgate party. They went straight to the chair lift and Richie had a blast. He skied next to Chris holding his pole. 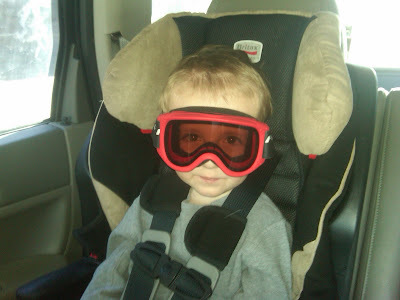 We are so excited to head to Sunday River now. Angela and I stayed back and attended Joanna Shumway's baby shower. Of course Angela was the hit of the party. Richie was super excited to get to wear green (he picked his Cetics jersey) to school today (instead of his uniform). Looks like he had a few too many beers at snack time! And Angela is just......well.....just Angela! We celebrated as a family by bringing the kids to Goody Glover's. Yes, it was a ridiculously crowded bar and very inappropriate for kids, but........Chris and I wanted corned beef and a Guinness. 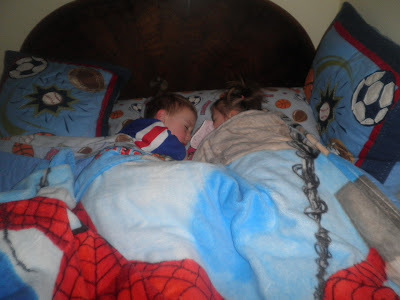 "The first picture is of the kids sleeping in Richie's bed together. Richie asked me to let Angela stay with him one day and they both fell right asleep! So cute. The rest I took of Angela finger painting.. in her rain boots of course! The picture of her with blue all around her mouth is because she sampled a glob of blue paint.. and when I asked her if she ate any she said NO! 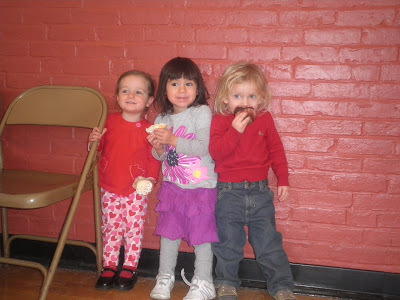 LOL"
"The first picture is of Angela, Alana, and Leo (Beccas son) at a NEMPAC Valentines day party that was held at the Nazarro. Angela ate cupcakes and made Valentines for you guys. The last pic is from pizza night at Alana's- Richie and Alana made most of the pizzas! The picture of just Angela is my favorite picture of her." 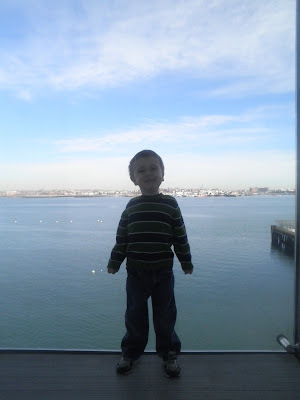 "Here are a few pics from the ICA (Institute of Contemporary Art) during school vacation week. Richie loved looking at all the artwork! The main exhibits were collages. The people who worked there gave Richie some string and various items to hold and take around with him while he looked at the artwork.. he was happy to discover that a lot of the collages were constructed of the items he held! I think it really helped him grasp the concept of what a collage was. They had these amazing floor to ceiling length windows that Rich kept making me take his picture in front of. After that we went down to the lobby where they had a craft for the kids to make their own collages.. the kids loved it. Then we walked home via harbor walk since it was a pretty nice day! The last picture is from lunch where Richie made me match food to plate color.. he LOVES my special green beans;-)"
"We spent over 2 hours in the construction room at the Children's Museum. 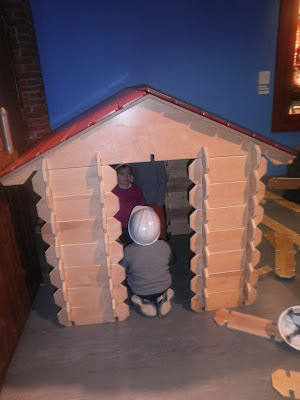 Somehow I got about 10 little kids to be my construction crew and build a house complete with a roof! They had the coolest building materials. Once it was done, Angela of course declared it "ME" and sat in it for a long time!" Today was the last day that the Steriti Rink was open for the season. We (Rich and Chris) decided to make the best of it. We got there in time to take one last lesson with Rich's favorite teacher Kate. As you can see in the video below, Rich is now quite a good skater. Then there was a three hour long open skate that most people came for a portion of. Not us. We stayed there for the entire three hours (that's 4 hours at the rink total). Rich didn't want to leave, although I'm not sure it was the skating that was keeping him there. As you can see his two friends Julia and Valentina were there, and for the second time in a week, I was ditched so he could skate with his girlfriends. Even while the Zamboni was out, he sat on the steps waiting with them. Although its tough to hear your son say "Dad you stay here so I can go do spins with my friends by myself", I am very proud of my little hockey player. Here are some of the awesome pics Dawn sends me during the day from her phone. They surely do have fun and these pictures make my day!